Just a bunch of hippies? A man with long blonde dreadlocks leads a procession of about 140 other people down am almost carless street. The crowd is predominantly young, cosmopolitan in its make up, and colourful in its outfits. Some sort of parade? No, the blonde dredlocks are under a hardhat, which complements the high visibility jacket and steelcap boots. This man works as a labourer in Christchurch’s red zone, part of the highly casualised and underpaid workforce that has been demolishing damaged buildings and making the city safe for new ones. He has been asked by the others in the group to lead up front in his PPE gear to symbolise what the protest is about. Its Labour day, and Christchurch is experiencing its first Labour day march is years (possibly decades) and it was organised by the Occupy Movement. At the end of the march an open mic is held. A university graduate talks about how he is working two jobs but still under a mountain of debt. A young woman talks about an injury she sustained as a result of understaffing in a previous workplace. A number of young workers tell similar stories, and a member of the Nurses Organisation tells the assembled crowd that she will do what she can to get her union to endorse this movement. Two other unions- Unite and the RMTU- already have. While a number of different view points and ideologies are present in the occupy camps (and in the much larger groups that attend the protests they call) this movement is at its core one based on class. The occupy protesters around New Zealand have raised hundreds of dollars for the locked out meat workers employed by Canterbury Meat Packers, and in Christchurch a lively picket was held. The people who are camping in public spaces know which side they’re on when a company attempts to cut staff pay by 30% and uses a lockout to achieve this. While the “hippy” criticism is used by both the sectarian left and the right, the latter also has “get a job” its in repertoire. That response may have made sense when used against the actual hippies of the 1960s- turning on and dropping out at the height of the post-war economic boom- but today the easy response is, where? New Zealand today is in a situation where 2000 people will line up for 140 positions at a new Supermarket. “Get a job” is not as easy as an angry talk back caller makes it sound. Besides, the vast majority of occupy protesters do have a jobs. This has actually been a hindrance as during the day when most protesters are at work the numbers thin out to a few students and shift workers. In Christchurch, a campaign specifically targeting the unemployment has begun and there is some talk of a new “right to work” campaign. The occupy campsites could appear more like a hippy dance party to passers by, there are bongo drums and and fire spinners- though there are also guitars and games of touch. The occupy camps are strictly drug and alcohol free, to abide by liquor bans, avoid apolitical arrests and to promote an environment welcoming to everyone, including parents of children. Statements about “pot smoking” that appeared on the blog Redline, are simply factually incorrect. When it comes to the bongo drums, whatever cultural or counter-cultural activities and styles activists use to express themselves they should be judged only on their politics and their activism. 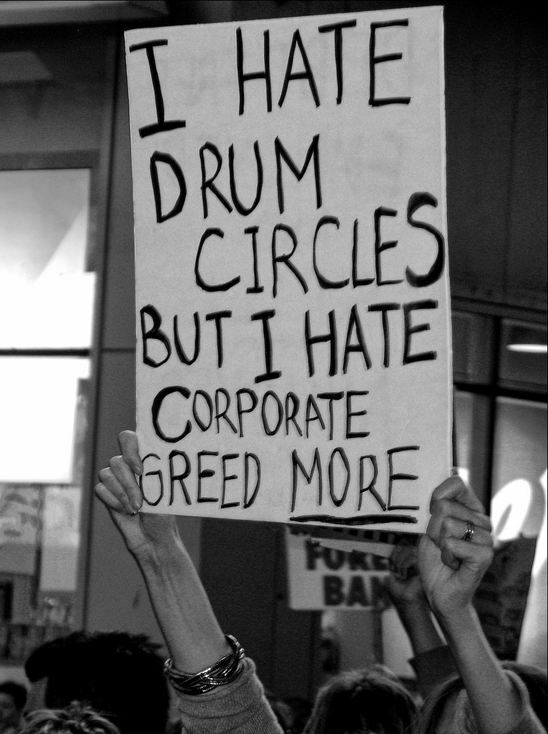 Besides, whats so bad about a drum circle anyway? I agree, whatever cultural or counter-cultural activities and styles activists use to express themselves they should be judged only on their politics and their activism. So what’s with the revolution on life support from already over taxed Christian charities? We have just had a visit from two very nice gentlemen – Vicar Jolyon White and Vicar John Day – who are from the Anglican Diocese of Christchurch. These wonderfully kind hearted gentlemen have voiced there support for the Occupy Movement and have also offered to help in any way they can. We would very much like to thank them for there ongoing personal support. We currently have some great conversations happening and this morning we had the kind assistance of The Christchurch City Mission is sorting out our food supply problems for the foreseeable future. We thank them greatly for this. Also the Salvation Army outreach van now makes us there last stop each night they go out for late night coffees and nibbles. We would also like to thank them very much for this great support. As usual the community spirit and support of the people of Christchurch is beyond question and beyond compare. The Methodist Mission was one of the first organisations to endorse the Occupy movement (after Unite and the RMTU) and it was decided at an early general assembly that we would not accept donations of food from them, as there were people who needed it more than us. At that point, the occupation was about half students and half workers, with a handful of unemployed. After two months though word has got around that Occupy Christchurch gives away free food and the demographics have shifted to a larger proportion of homeless and beneficiaries, I imagine the City Mission is feeding a lot of the same people, but just at a new location.